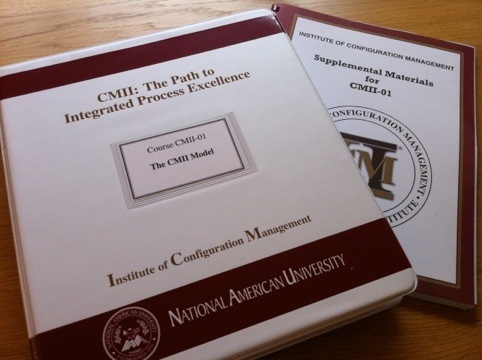 Yesterday I got the study materials for the upcoming courses–which will lead to a certification in configuration management–I will attend over the upcoming weeks. I start the first course on Monday and before mid June I will have completed four courses. Two of them will be online through the Institute of Configuration Management in the US and the other two courses I’ll be taking on-site here in Stockholm. After these four courses I have two more left to attend in September. The package was quite heavy and when opened I understood why. I only brought home the two books I need next week from work today because I knew my arms would hurt if I brought everything home at the same time. The books I got was only for the two online courses. Clearly I need to make room in my bookcase so I can store everything! There will be plenty of materials after I’ve completed the six courses!